Greg Lounsberry hand builts these pretty looking effect pedals in his workshop in Maryland, USA. Being a guitar player and having quite some experience in modifying robot circuitry for army use in harsh conditions, Greg managed to design and build preamps/overdrives that were noticed by guitar players, bass players and .... keyboard players! The so called clonewheels (tonewheel organ simulation keyboards like being made by Hammond, Nord and Crumar) have become very popular and their sound, dynamics and character resemble the vintage Hammond tonewheel organs more and more. 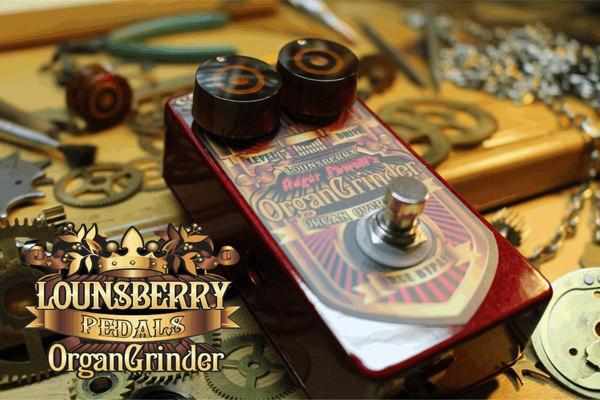 The Greg Lounsberry ORGAN GRINDER was quickly picked up as a big improvement for the internal overdrive of clonewheel organs, especially when used with a real Leslie rotary speaker. The list of users of Greg’s pedals is growing rapidly (Ronnie Foster, Stevie Watts, Mitch Towne, Frank Montis and off course Roger Powell) and TMA is very proud to announce distribution of the line on the EU continent.